Every year, new technologies arise that facilitate the small business marketing. More consumers are experiencing the internet through their phones as opposed to their desktop computers, according to SmartInsights. Mobile has become not only a profitable addition to the marketing toolbox, it has become a priority for any business. The time has come for small businesses to jump on the bandwagon and learn how to optimize mobile interaction with their audience. In this article, we’ll discuss seven mobile trends that you should take note of. A “message they want” might include notifications of promotions, special offers, news and exciting events. Messages should not include daily reminders to shop, overly gushing testimonials, in-depth reminders of your superb guarantee/warranty or warnings with “time is running out!”-esque content. While these bits of information may be useful in the conversion process, they should be saved for the checkout process -- not the inbox. Responsive design is an approach to website design where the site will look great no matter the device -- desktops, tablets or phones. In a recent survey conducted by Adestra, companies were asked how they were optimizing for mobile usage. The most popular response was using a simple template that works for all devices (52 percent), and the second choice was creating a responsive template (39 percent). Make sure your site adjusts and evolves based on the device. According to Email Monday, 36 percent more people are now opening emails on their phones than on a desktop, so don’t forget to make your emails responsive as well. 57 percent of users say they won’t recommend a business with a poorly designed website, so keep these design tips in mind. Cut your copy and content down to the bare essentials. When they first land on your website or app, it should seamlessly guide them to conversion without any distractions. All other information can be hidden on a side menu or link carefully placed in the content. Your menu navigation also needs to be straightforward and logical. Try to boil it down to the five most important items -- if you need more, you can always nest more options inside. Finally, leave enough space between buttons so that even the clumsiest thumbs can navigate to the desired page without something else popping up. 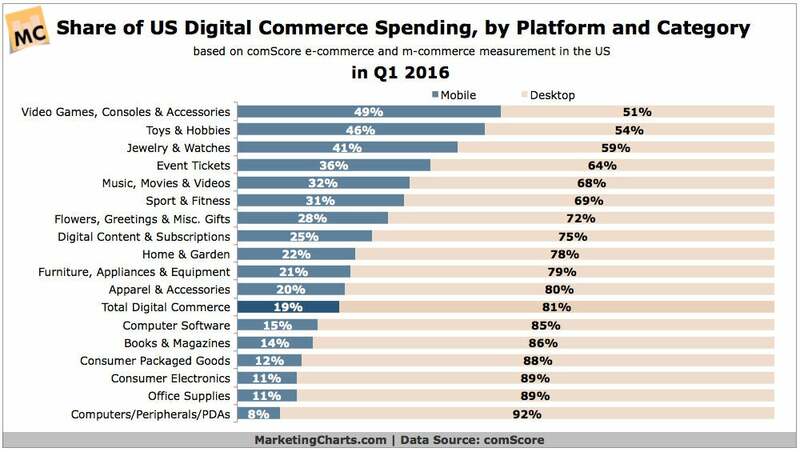 eCommerce is one field where desktop still dominates mobile, but the trend is undoubtedly tipping in favor of the latter. Mobile commerce sales now account for about 33 percent of all onsite conversions, which is up from 28 percent in 2015. It’s clear where the trend is heading and you don’t want to miss out on potential customers by not optimizing your website or app for mobile payments. Make sure that your app or site is designed in a way that makes the payment process logical and convenient. Remove as many barriers as you can between looking at an item and shipping the item to their house. Controlpad is a great cloud-based software system that can help you integrate a fast, automatic payment and shipping system to your site/app. With high end, modern software like this, your customers can find, buy and ship your top products to them straight from their phone in just a matter of minutes. Facebook is constantly changing and evolving, so it’s important to keep up with what’s new and find ways to use it in favor of your business. There are around 1.86 billion people on this social media platform, making it difficult to stand out in the noise. The big benefit of Facebook Live is that their algorithm gives it a higher priority in users’ feeds. It’s also a good way to build relationships with your customers because they know it was live, raw and unedited. It makes them trust you a little more -- and trust is one of the most valuable assets your business can have. To learn how to use Facebook Live to dramatically increase mobile sales and conversions, watch this short demo. Instagram also offers paid ads, just like Facebook, and they’re effective -- surprisingly effective. Seventy-five percent of Instagram users take action when showed a relevant ad. Instagram users are engaged and interested in clicking on a well-crafted ad that leads to a conversion-friendly website all from their mobile device. Since there are over 500 million active monthly users, this isn’t a bad route to go. Every year, new technologies arise that facilitate the small business marketing. Optimizing for mobile marketing, conversions and sales is the next step and an absolute must for all small businesses in 2017.